The islands of São Tomé and Príncipe were discovered by the Portuguese sailors in the 15th century. In the 16th century the islands became a part of the Portuguese colonial empire. The unrest amongst the plantation workers, who were subjected to forced labor and unsatisfactory working conditions, began in the 20th century The culmination point was reached in 1953, when numerous riots outbroke and several hundred African laborers were killed. This event, called Batepá Massacre, is the major event in the colonial history of the islands. 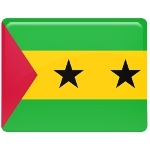 São Toméans formed the Movement for the Liberation of São Tomé and Príncipe in the late 1950s. The Caetano dictatorship was overthrown in 1974 and São Tomé and Príncipe achieved independence on July 12, 1975. The country pays tribute to all who died in the struggle for independence of the state on February 3.